Who Was Behind the Raid on North Korea’s Spanish Embassy? A look at Cheollima Civil Defense, the group allegedly behind the February incident in Madrid. The 10 people who allegedly raided the North Korean Embassy in Madrid last month belong to a mysterious dissident organization that styles itself as a government-in-exile dedicated to toppling the ruling Kim family dynasty in North Korea. The leader of the alleged intruders appears to be a Yale-educated human rights activist who was once jailed in China while trying to rescue North Korean defectors living in hiding, according to activists and defectors. Details have begun trickling out about the raid after a Spanish judge lifted a secrecy order Tuesday and said an investigation of what happened on February 22 uncovered evidence that “a criminal organization” shackled and gagged embassy staff before escaping with computers, hard drives, and documents. A U.S. official said the group is named Cheollima Civil Defense, a little-known organization that recently called for international solidarity in the fight against dictatorship in North Korea. What Is Cheollima Civil Defense? Details about the creation of the Cheollima Civil Defense group are hazy. The word “Cheollima” — spelled “Chollima” in the North — refers to a mythical winged horse that the government often uses in its propaganda. In March 2017 the group said it had arranged the escape of Kim Han Sol, the son of Kim Jong Nam, the half-brother of North Korean leader Kim Jong Un who was assassinated at a Malaysian airport earlier that year. A man claiming to be Kim Han Sol appeared in a YouTube video at the time and said he was safely with his mother and sister. Recently the Cheollima Civil Defense group declared on what appears to be its website the establishment of “Free Joseon,” which it described as “a provisional government” that would fight against “the criminal incumbents of the north.” The Joseon (or Choson) Dynasty ruled the Korean Peninsula for more than 500 years until 1910, when Japan colonized Korea, which was later divided at the end of World War II. The group also recently posted a video showing an unidentified man destroying glass-encased portraits of North Korea’s two late leaders. South Korean media reported that the group was behind the writing of “Let’s topple Kim Jong Un,” the current North Korean leader, on the wall of the North Korean Embassy in Malaysia. 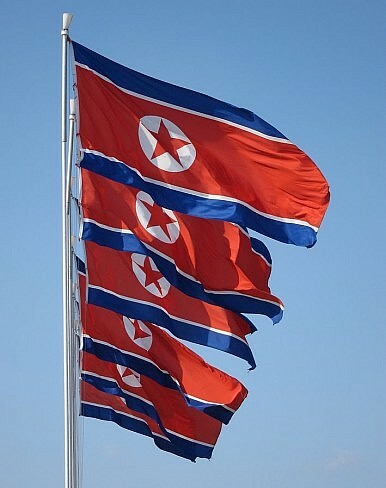 The Spanish court report said the intruders urged North Korea’s only accredited diplomat in Spain, So Yun Sok, to defect. The Cheollima website said the group shared “certain information of enormous potential value” with the FBI, under mutually agreed terms of confidentiality. The FBI said its standard practice is to neither confirm nor deny the existence of investigations. If Cheollima was behind the embassy break-in, it indicates the involvement of North Korean defectors who have experience working for North Korea’s military or security authorities, said Nam Sung Wook, a former president of the Institute for National Security Strategy, a think tank affiliated with South Korea’s main spy agency. A Spanish court document identified the leader of the group that entered the embassy as Adrian Hong Chang. This is likely to be Adrian Hong, who in 2005 co-founded Liberty in North Korea (LiNK), an international activist group devoted to rescuing North Korean refugees, according to North Korean defectors and activists who spoke with The Associated Press. Hannah Song, CEO of LiNK, said Hong has had no involvement with the organization for more than 10 years. “We have no knowledge of his recent activities,” Song said. The Spanish judge, Jose de la Mata, described Adrian Hong Chang as a Mexican national and resident of the United States. According to the Spanish court report, the man flew to the United States on February 23, got in touch with the FBI, and offered to share material and videos. The report didn’t say what type of information the items contained or whether the FBI accepted the offer. An online message by AP to a verified Twitter account linked to activist Adrian Hong wasn’t immediately answered. Hong is known for his work helping North Koreans flee their homeland and resettle in South Korea and elsewhere. LiNK said it has helped more than 1,000 North Koreans reach safety. Fellow activists and North Korean defectors said Hong was detained in China briefly in the 2000s because of his work. Kang Chol-hwan, a prominent North Korean defector-turned-activist, said he was close to Hong and helped him with LiNK. Kang, an ex-inmate of North Korea’s notorious Yodok prison camp, said Hong became passionate about North Korean human rights after reading his detention memoir. He said Hong visited Seoul and rallied against what he believed were pro-North Korea sympathizers and those silent on North Korean human rights issues. Kang, who said he last saw Hong about five years ago, said Hong wanted to “muster anti-government forces [in North Korea] and bring down North Korea from the inside.” Kang said Hong even went to Libya to study the fall of dictator Muammar Gaddafi so he could explore ways to topple the Kim government. Kang believes Hong heads the whole Cheollima group. “A class of Korean technocrats must be capable of stabilizing and rebuilding on a national scale,” Hong wrote. By Kim Tong-hyung and Hyung-jin Kim for The Associated Press with additional reporting by The Diplomat. Associated Press writer Aritz Parra in Madrid contributed to this report.